After nearly 20 years of absence, the time felt right to revisit Greece. Oh how I’d love to sail around the Cyclades, taking pitstops in Santorini and Naxos. But this trip was travelling to Athens on a budget, in peak season! Yeah… didn’t think that one through. The plan was to head to Athens as a base camp, with a little island time on top. Is it safe to travel to Athens? As I checked-in for my EasyJet flight from London to Athens, my phone pinged with news alerts. “Is Greece safe? State of emergency declared as Athens fires kill 50 – latest travel advice”, “Dozens dead as wildfires near Athens force people to flee into the sea”. Ummm. As I boarded my flight, EasyJet announced that they were offering a full refund on flights or flights up to the same value to anywhere else in Europe. This felt like a bold move for the budget airline that isn’t known for it’s generosity. But I had a friend flying in from Madrid and she was already en route. Personal safety aside, I have mixed feelings about flying to an area that’s in a state of emergency. It can put unnecessary pressure on the local infrastructure already struggling to cope. Yet, it can also bring in essential income that the economy relies upon. I fully expected to land into hellfire and brimstone, the sky bathed in flames. If we managed to land in Athens, then perhaps the country would be in mourning and businesses closed. Despite 91 people losing their lives in this terrifying natural disaster, there were no signs that such a tragedy had occurred only a few miles away. Landing in the city, I was instantly glad that I’d made the journey. Spending cash with local businesses that are undoubtedly about to lose a few quid felt important. Oh the heat… don’t go to Athens in the Summer they said! Well with most of Europe perspiring like Richard Dawkins at Call to Prayer, why should Athens be any harder to bear? Leaving oh ‘ye of little air con London’ in a heatwave, for Athens didn’t feel too crazy. I was fractionally right, most buildings did indeed have air con, or at least fans. However, most of Athens’ beauty is an outside affair and that involves exploring ruins on sun-scorched hilltops. As they’re only open 8am to 8pm any bold gestures of sunrise exploring weren’t possible and therefore onward into the midday sun we ventured. 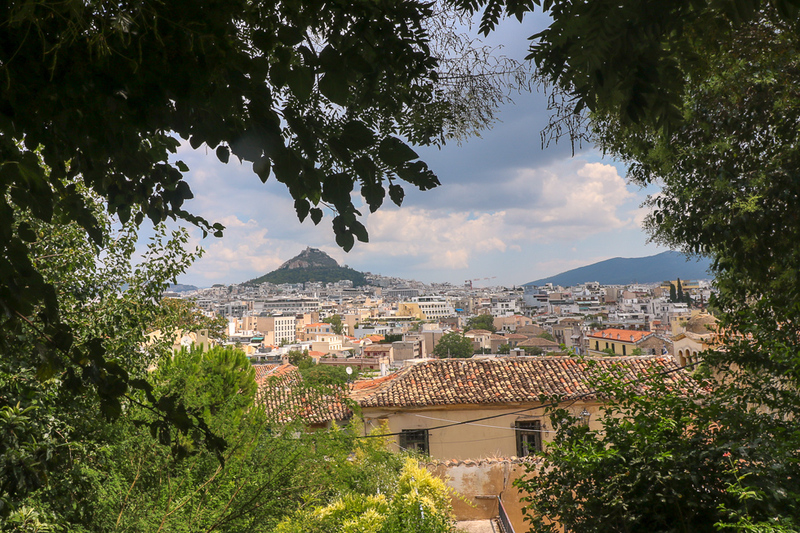 If you really want to explore Athens on a mega-budget most of the sites are visible from afar, but there are also cleverly positioned trees obscuring your view. 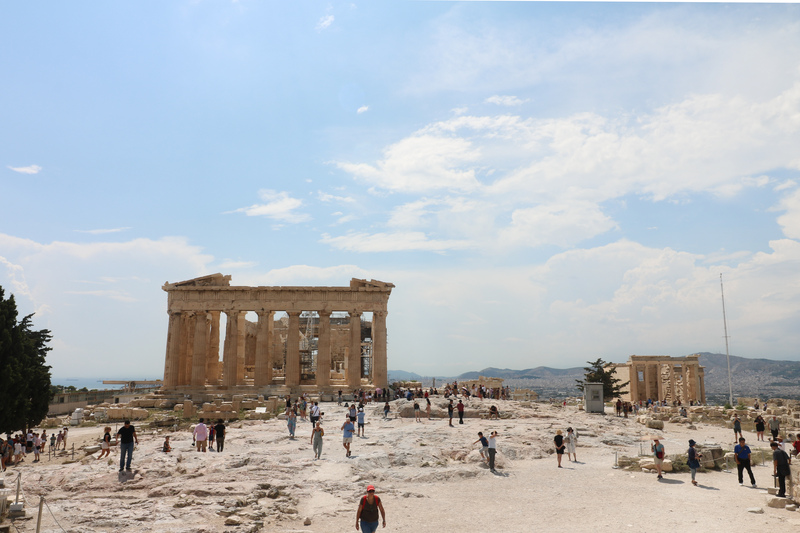 It costs 30€ to see nearly all of the sites and your ticket lasts for 5 days – there are 6/7 key sites including The Acropolis. But fellow students listen up! On the off chance they’d knock a euro off I asked if student discounts were available, and was totally blown away when they told me I could see it all for free. Yep that’s right it cost me bugger all. 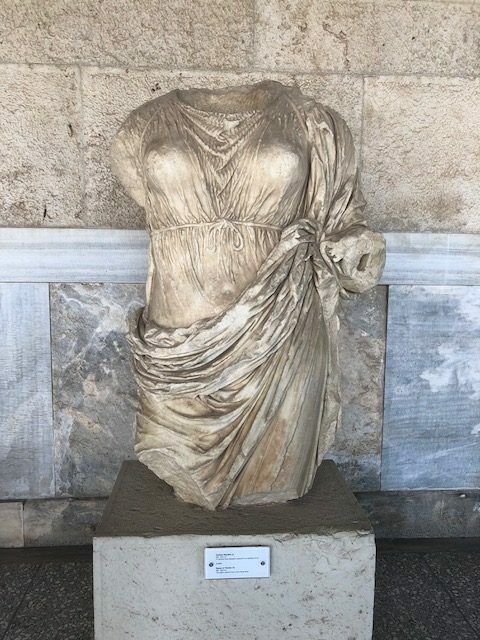 There are a lot of headless statues, some of them just say ‘woman without head’. But some of them helpfully have their names labelled alongside them. 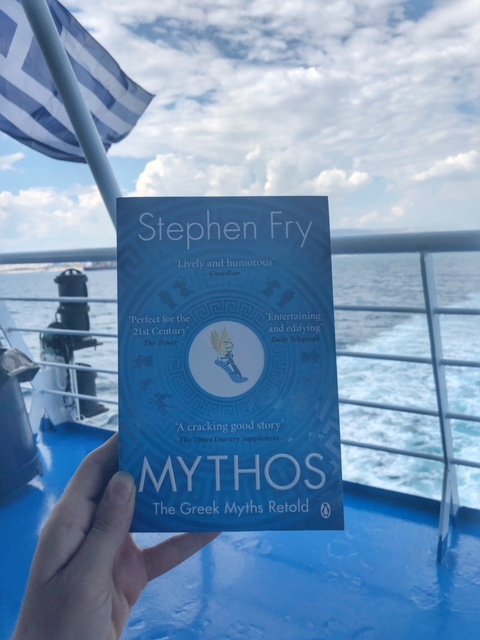 Unless you’re already well versed in Greek mythology my recommended holiday reading is Mythos by Stephen Fry. Coming from London, Athens felt incredibly affordable. I always stay in hostels and Athens hostels are among the cheapest in Europe. Ranging from 10€ a night for a basic backpacker dorm room, up to 30€ for an all-singing all-dancing Acropolis facing roof-terraced hostel. I’m not going to recommend my accommodation here as we went full budget and suffered the consequences of broken air-con and limited water. Both non-essentials, I’m sure you’ll agree for a city soaked in perspiration. Athens is a city geared up for students and I like to think they’re staying true to their academic history from yesteryear. Don’t be shy in asking for student discounts as metro travel is half price too. You just have to queue at the ticket office and flash your student ID. One of the main reasons we head to Greece is for the food though amiright? My travel companion and I had been salivating before we even landed over all the food we were going to feast on. Every meal we shared a selection of Meze or main dishes so we could work our way through as many meals as possible. First off the Souvlaki. That’s sumptuous kebab meat which we chose to eat delicately wrapped in freshly baked pitta with salad, fries and Tzatsiki all lovingly squidged within its plump bready nest. The average cost for a Souvlaki on the go is 2.50€ – I know right! We tested a few (research purposes) and the very best can be located on Omonia Square. Now, because I didn’t realise it was going to be the best kebab I’ve ever eaten I didn’t make a note of the name, and despite spending at least an hour trawling google street view I can’t find it! Just hop-off at Omonia’s metro stop (September 23 exit) cross the square, head towards a pizza restaurant and you’ll find the best Souvlaki right next door. Send me a pic, if you make it! One more honourable mention – a supermarket themed cafe on Aiolou street. The grilled halloumi (Saganaki) came coated in honey and sesame seeds – as you bite down the flavours keep revealing themselves, layer after layer of mini mouth shocks. Happy hunting! Navigating from Athens airport to the hostel with my world on my back wasn’t the worst experience, and after a few easy to navigate metros I landed in Omonia. Google maps then had a meltdown and I found myself zig-zagging dark side-streets in search of my hostel and my friend. Time was off the essence as I knew she was already supping some cool, cool Mythos lager. The only reason to head to this area is budget accommodation and the best souvlaki in town! Everyone will tell you to go to Plaka and they’re right. After being scorched by the Sun Gods on Acropolis Hill, we stumbled upon this piece of pastel coloured home perfection. A kind man on a Segue spotted us looking lethargic and probably a little dead behind the eyes. He segued right up to us, whipped out a map and ushered us to start walking down a parallel street. The segue God, we’ll call him Hermes, was a saviour, as Plaka sure is pretty. You can easily spend an afternoon getting lost and if you get lost in the right direction you’ll discover Anafiotika, a white-building filled neighbourhood within Plaka. To be honest, I may have travelled through multiple neighbourhoods on this wander. 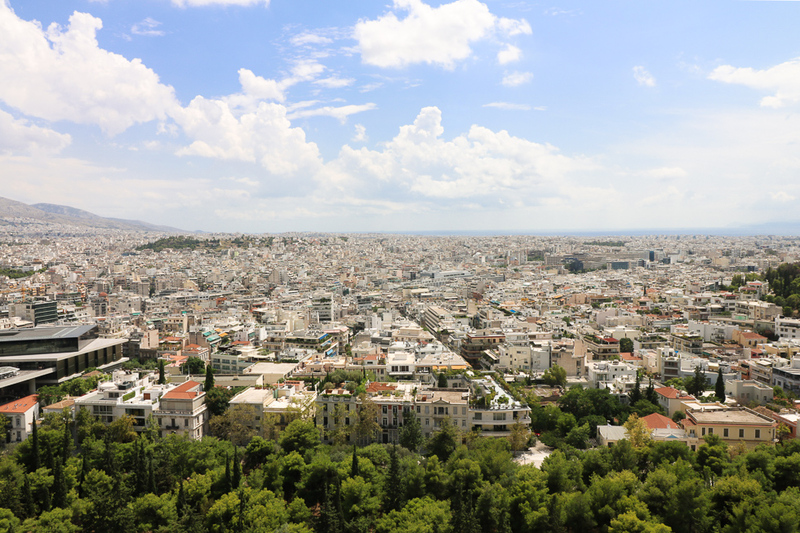 Head to Plaka and take whichever windy pathway feels right and you may get treated to a city view. From many of the buildings, delicious herby cooking smells emerged and there was a little streetart tucked to be discovered. This district is where all the fancy people go for fine foods and boutique shops. This is where you get to fill your backpack with fine jewellery after saving €€€ on your budget accommodation and eating 2€ Souvlaki. Nah me neither. I’m not sure if Syntagma is classed as a neighbourhood or if it’s just a big square. However, It’s a logistical hotspot which we passed through to get to both the airport and the port. 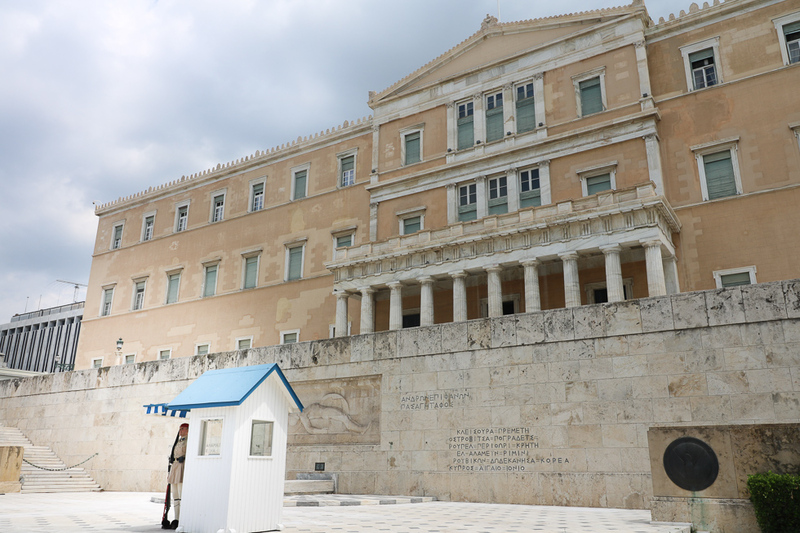 It’s also where the Government buildings are and if you’re a fan of military robot dancing then Syntagma is for you! There are more distinct neighbourhoods but alas I ran out of exploring time. Check out this guide by TripSavvy, it seems pretty spot on. If anyone goes to Exarcheia can you let me know what it’s like please? According to the guide, it’s a place where writers and poets hangout and it’s still gritty, not too gentrified. Kicking myself for not making it out there. You want your faith restored in hospitality and humanity. We had kind locals stopping us in the streets to recommend places to visit, restaurants to try and sometimes just for a chat. You love cats. 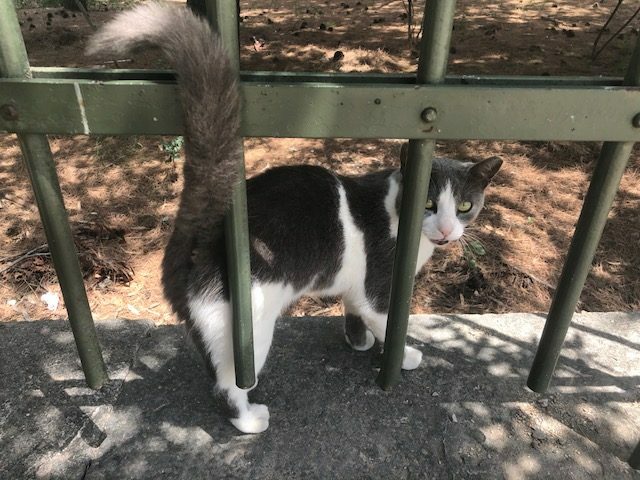 I can’t believe I’ve got this far without mentioning that the felines own this city. Cats nonchalantly pose in front of street art adorned walls and laze in every bit of shade. They’re healthy and fluffy and all keen for a cuddle. The locals leave bowls of biscuits out for them so they’re human-friendly and well-fed. You have tastebuds. Mousaka, Stifado, Kleftico, Souvlaki… Saganaki. If you read them out loud they work as a spell, conjuring up a tasty feast, try it! You want to step back in time. Athens is one of those cities that even the most limited imaginations don’t have to work too hard to visualise times gone by. For those with imaginations that rival Roald Dahl’s then picture yourselves in times that never existed. Greek mythology is fascinating, with so many gods representing complex human behaviour that we’re still getting to grips with today. You’re on a budget. 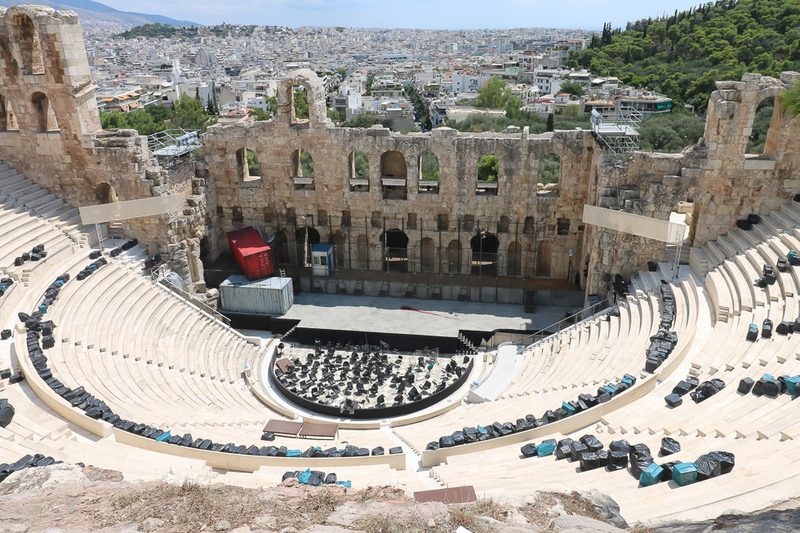 Athens is one of the most affordable capitals in Europe for travellers. Sleep cheap, eat cheap, travel cheap, see stuff cheap. If you’re a student or you have binoculars it’s totally possible to explore Athens on a budget. You want some island time. Athens does have beaches, but we chose to hop on a ferry and head to Aegina. It’s where the Athenian’s go on their weekend breaks apparently. Aegina is just 40 to 70 minutes away (depending on the boat) from the Piraeus Port and we paid 8€ for a single ticket.